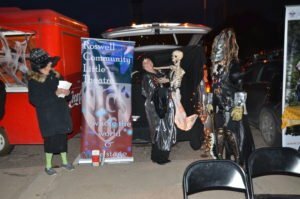 Home/Announcements/Chamber of Commerce Trunk or Treat Great Fun for all! 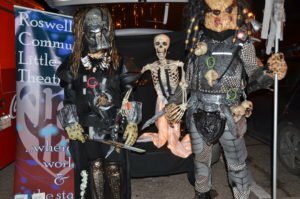 Last night we had a blast with the Chamber of Commerce Trunk or Treat event. Carol Bignell, Ed and Kathy Cook, and Mary McClure (possible new RCLT member!) dressed up and entertained loads of parents and kids with our Zombies and Alien themed trunk. Lots of great costumes and make-up came by and information went out about our upcoming shows and opportunities to get involved and play a part at RCLT. 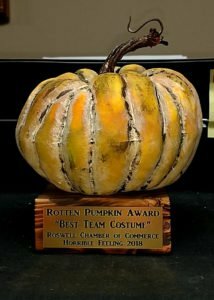 At the close of the evening, our team was awarded the Rotten Pumpkin for “Best Team Costume”. Great job everyone! Come to the general meeting November 6 to see the presentation of the coveted award!